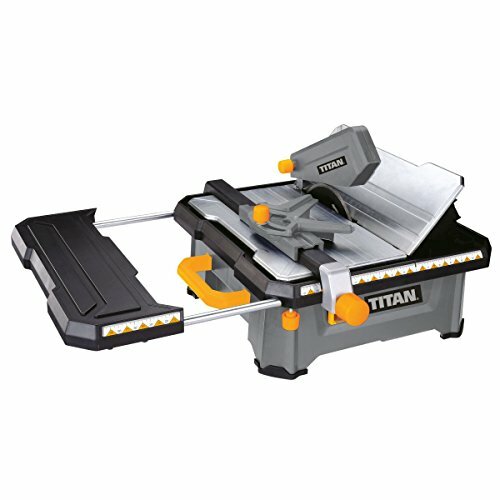 Portable and robust tile saw with unique water recirculation system and carry handle. Supplied with 180mm diamond blade, adjustable splash guard, extension table and disc wrench. Product contents:TTB597TCB, diamond blade, splash guard, mitre cutting guide, extension table, parallel fence and disc wrench. Specifications:Blade dia. 180mm x 22.2mm bore. Table size 345 x 345mm. Bevel cuts 0, 15, 30 and 45degs. No load speed: 5500rpm. Weight 8.2kg. View more information.